Until a few years ago, the Commander's Cup was a long-standing tradition for the UNM ROTC units—a friendly competition between cadets from all three military branches housed on the UNM campus. After a bit of a hiatus, the units have come together and are going to be competing once again. “The goal of the event is to get our future military leaders working together and engender a bit of espirit de corps and friendly competition,” says Professor of Military Science and Army ROTC Commander, LTC Alissa A. McKaig. The event begins on Friday, March 22 at 4 p.m. with an opening ceremony and flag football game on Johnson Field, and culminates with Field Day at the same location on Friday, March 29 at 3 p.m. with a combat relay race, BBQ, and closing ceremony. The winners of the competition not only have bragging rights, but also get to house the coveted “Commander’s Cup” trophy in their unit—a trophy which currently resides in Navy Headquarters. Other events include a dodgeball game in Johnson Gym on Tuesday, March 26 at 5:30 p.m. and a physical fitness test on Wednesday, March 27 in front of the Navy/Marine building in the afternoon. “It’s a friendly competition between all three branches and since we’ll be working together throughout our years in service, this event introduces a sense of competition between the ROTC units,” says cadet Owen Marx. Although all events are open to the public, spectators are especially encouraged to attend the Field Day event on Friday, March 29 and cheer on their favorite unit. 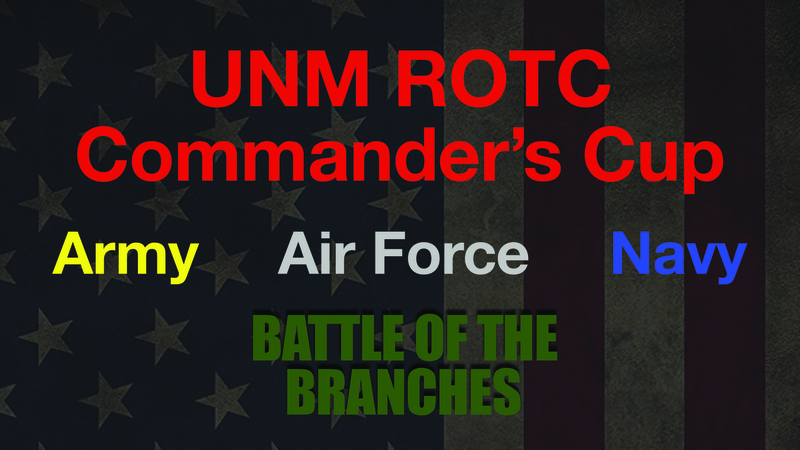 For more information on the UNM ROTC units, visit their websites: UNM Air Force ROTC, UNM Army ROTC, UNM Navy/Marine ROTC.